The L-T Experience: Iron Crafty #19: Monsters and Witches and Ghosts Oh My! Iron Crafty #19: Monsters and Witches and Ghosts Oh My! "Halloween is just over a month off and I am itching to get started on decorating. Ideas are popping up all over Pinterest and the dollar store is full of good cheap supplies. So, that is our theme this challenge, make something for Halloween. (To all you crafty moms this is a chance to get those costumes done early!)" So I went with something to keep my fingers busy while I watch all the new shows that are coming out now. I always feel so lazy if I'm not doing something while sitting in front of the TV. 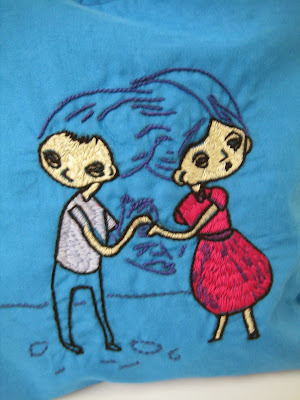 I actually got the template from a book called Hoopla: The Art of Unexpected Embroidery. I got it from my sister and brother in law last year for Christmas. I'm glad I finally got a chance to try something from it. I even lined the bag with scary fabric. This was one of those pieces of fabric that gets shoved into a bag with really cool Christmas fabric at the thrift store. You know, the extra ugly stuff they want to get rid of? Paolo and Stella "might" be up for grabs as the door prize at the WEST sale that I am a vendor at in October. I say "might" because I'm really attached to this bag right now. I have no idea why, but I love it so much. I want to use it as my library book bag. Don't know why this photo is sideways on here, but it still shows some of the stitchery. According to the designer of Paolo and Stella, they are fighting over what to have for dinner. There is an entire backstory in the book. To see all the other super creeper Halloween inventions from Iron Craft, please check out the Flickr Group. Oh yeah, they are super creepy & I can see why you are attached to them! It is one of those things like looks cute at first glance & then you realize what it really it. Reminds me of when I was doing a release party for the Smashing Pumpkins Siamese Dream album. I made siamese twin baby dolls and used them to decorate the venue. Two older ladies were there having lunch & asked if I was having a baby shower. ALl I could think of was that was one sick baby shower!